​Citroën C4 SpaceTourer brings you the essence of Citroën design and technological innovation. You can see it in the bold dynamic lines and the unmistakable light signature both front and rear. Inside, new levels of comfort and versatility combine to create an engaging and inspiring place for everyone. Watch the videos to discover more. As on C4 Cactus, Citroën C4 SpaceTourer has a rear black chevron with chrome surrounding. This new modern signature emphasis the double chevron. 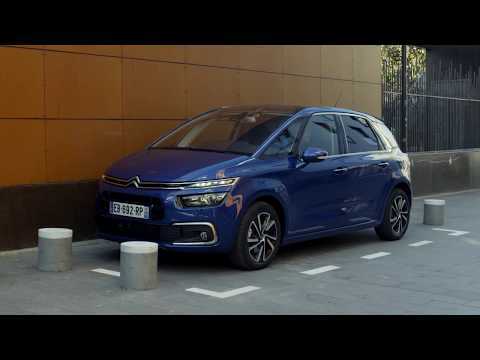 ​For maximum comfort and driving pleasure, Citroën C4 SpaceTourer is now available with an EAT8 (Efficient Automatic Transmission 8) gearbox*. The EAT8 gearbox optimises gear changes while cutting fuel consumption and CO2 emissions. This new automatic gearbox cuts fuel consumption by up to 7% compared with EAT6. This result is achieved through the transition to 8 gears and through greater efficiency, with Stop & Start extended to 20 kph. EAT8 is also lighter and more compact allowing the driver and passengers to enjoy a smooth, comfortable ride. Our PureTech petrol engine was named ‘2016 Engine of the Year’ in its category for the second consecutive year. The engine also offers one of the most comfortable driving experiences on the market - even at the lowest speeds. With 120 patents to its name, the three-cylinder Turbo PureTech petrol engine cuts fuel consumption and CO2 emissions by 18% compared with its four-cylinder petrol predecessor. The engine holds two fuel economy records. There are two refined and advanced PureTech petrol engines, the PureTech 110 and PureTech 130.